The Sheffield, Ashton-Under-Lyne and Manchester Railway was opened in stages between 1841 and 1845 between Sheffield and Manchester via Ashton-Under-Lyne. The company was formed in 1835 and it appointed Charles Vignoles as its engineer. A route was proposed which required a 2 mile long tunnel and passed through Woodhead and Penistone. Vignoles and Joseph Locke were asked to make independent surveys and in October met to reconcile any differences. Their meeting resulted in the decision to build a longer tunnel so as to lessen the gradients needed on the line. The line obtained its Act of Incorporation in Parliament in 1837 and work on the tunnel started. Vignoles arranged for the boring of a series of vertical shafts followed by a horizontal driftway along the line of the first bore. Enough land was purchased for two tunnels but it was only intended to build one at first. A ceremony was held on 1st October 1838 at the west end of the tunnel at which ground was disturbed for the first time. In 1839 work was progressing well with Thomas Brassey as contractor. However Vignoles was not relating well to the company’s board and he resigned. Joseph Locke agreed to act in a consultative capacity if the Board would appoint resident engineers for the day to day supervision of the work. In 1841 Locke reported that the tunnel would probably cost £207,000, about twice the original estimate, because the amount of water encountered required the purchase of more powerful pumps. By this time a length of the line was open for business from Godley to a temporary Manchester terminus at Travis Street. In 1842, Manchester Store Street (now Piccadilly) was brought into use and at the eastern end the line had linked to Broadbottom and Glossop. By 1844, the western end of the Woodhead tunnel had been reached. In 1845 the eastern section of the line in Yorkshire was opened between Dunford Bridge and Sheffield. The tunnel was finally ready for inspection in December 1845 and after it was approved the formal opening of the line took place on 22nd December that year. Besides Woodhead, there were short tunnels at Audenshaw Road, Hattersley (two), Thurgoland and Bridgehouses. Among the bridges the two most notable were the Etherow Viaduct and the Dinting Vale Viaduct, the latter with five central and eleven approach arches. The line initially terminated at a temporary station at Bridgehouses until Sheffield Victoria was built in 1851. Dinting Vale Viaduct – at the top, the original viaduct, at the bottom, the later replacement. While the line was being built, the directors were looking at ways to extend it. They had hoped to connect to the Liverpool and Manchester Railway, but their approach to the board of that line was rejected. Eventually they secured a relationship with the London and Birmingham Railway which enabled the Manchester, South Junction and Altrincham Railway to be put before Parliament in 1845. That line was not completed for some years. 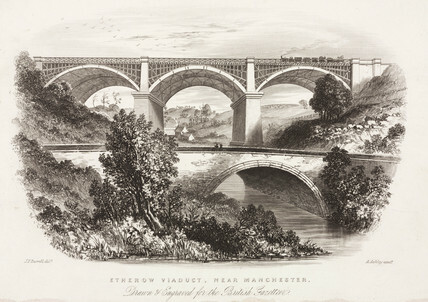 The Ashton to Stalybridge branch which had been part if the original scheme was completed in 1845. And in the same year a branch was built to Glossop itself, which needed no Act, since it was financed by the Duke of Norfolk and ran over his land, the original Glossop station was renamed Dinting. In 1844 representatives of the proposed Sheffield and Lincolnshire Junction Railway made plans for a line from Sheffield to Gainsborough. Plans were also made for the Barnsley Junction Railway to connect Oxspring with Royston on the North Midland Railway. The directors of the Sheffield, Ashton-under-Lyne and Manchester Railway realised that expansion was best achieved by amalgamating with other lines, after the pattern being set by the Midland under George Hudson. In 1845, they gained shareholders approval for the Manchester, South Junction and Altrincham Railway, the Sheffield and Lincolnshire Junction Railway, and also the proposed Barnsley Junction Railway. They would also lease the Huddersfield and Manchester Railway and Canal Company. • an extension of the Barnsley Junction to Pontefract joining the Wakefield, Pontefract and Goole Railway. • The Huddersfield and Sheffield Junction Railway. In September 1845 agreement was reached in a meeting in Normanton, agreement was reached to amalgamate with the Sheffield and Lincolnshire Junction Railway and the Great Grimsby and Sheffield Railway. Further amalgamations included the Grimsby Docks Company Railway and an attempt to take over the East Lincolnshire Railway which was planned between Grimsby and Lincoln, although ultimately that was taken over by the Great Northern. The merger received royal assent in July 1846 and the combined company was formed at the beginning of 1847. The line became the Manchester, Sheffield and Lincolnshire Railway. 1. https://www.gracesguide.co.uk/Sheffield,_Ashton-under-Lyne_and_Manchester_Railway, accessed 9th March 2018. 2. https://www.gracesguide.co.uk/Charles_Vignoles, accessed 10th March 2018. 3. https://www.gracesguide.co.uk/Joseph_Locke, accessed 10th March 2018. 5. https://en.m.wikipedia.org/wiki/Sheffield_and_Lincolnshire_Junction_Railway, accessed 10th March 2018. 6. http://discovery.nationalarchives.gov.uk/details/r/C1793638, accessed 10th March 2018. 7. https://www.railscot.co.uk/Huddersfield_and_Manchester_Railway_and_Canal_Company/index.php, accessed 10th March 2018. 8. https://en.m.wikipedia.org/wiki/Manchester,_Sheffield_and_Lincolnshire_Railway, accessed 10th March 2018. This entry was posted in Ashton-under-Lyne Blog, Railways Blog on March 10, 2018 by rogerfarnworth.